Within the Deal Analyzer software is a powerful Wholesaling Calculator which allows you to accurately estimate what a Landlord would pay for a deal & then factor in your profit as a wholesaler to get your maximum allowable offer “MAO”. 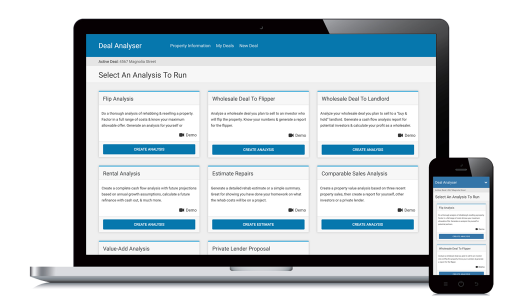 Create a beautiful wholesale deal analysis for yourself or other landlords & investors. As a Wholesaler, calculate all the key numbers on cash-flow, expenses, debt coverage, vacancy rates, various value cap rates, returns & more so you know what a rental investor will pay for your deal. Take your analysis to the next level with detailed marketing materials & features including downloadable PDFs & shareable links.